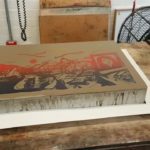 Lithograph Fine Art Printing : What Is a Lithograph? Lithography is based upon the fact that oil and water do not mix. It was invented in 1796 by German author and actor Alois Senefelder as a cheap method of publishing theatrical works. Lithography is done with polished stones or metal. The intent of a lithograph is to let the artist speak through the stone.